The KADIST mobile app features an art news section that compiles content from global sources covering contemporary art. 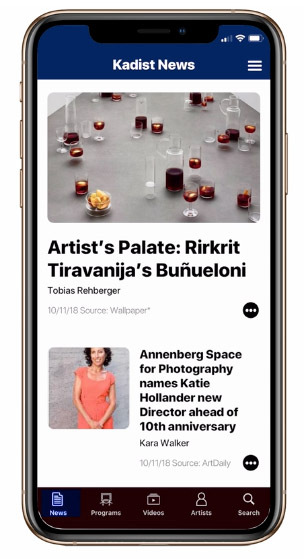 As users of other general-news apps know, finding a refined access point for contemporary art updates can be challenging. The KADIST app uses an “artist centric” algorithm, culling the latest articles from hundreds of content sites into a single feed, which are then filtered by relevance to a growing community of over 900 key artists. Additional features of the app include smart news feeds that learn each user’s preferences, and access to the KADIST Video Library. The app also compliments this website, providing access to over 100 video interviews with artists from around the world, and details about upcoming events and exhibitions at KADIST’s venues and partner institutions. Now available for iPhone, Click here to download the app for free!